MoldMan Systems™ has its own line of copolyesters under the name elemelt™. 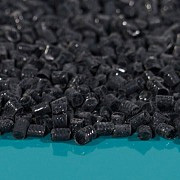 Designed for use in low pressure molding applications, elemelt™ TC Series Copolyesters provide an alternative to polyamides where solvent resistance, high adhesion, elasticity and memory retention are required. TC Series Copolyesters have a high molecular weight, short open time, and a high melting point. Application temperature is 180-210°C which is ideal for PCB encapsulation and durability. Compatible with Mold Man® 1050 and 8200.